OUST UBER bushings are manufactured using a blended pre-polymer urethane. This means they are ridiculously resilient! When we compressed them with 20,000 pounds of pressure for three minutes they returned to their original shape in 27 seconds. Try and do that with your bushings! These bushings come 2 in a pack. 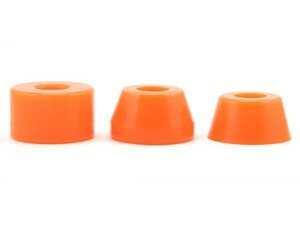 Our standard package includes 1 barrel and 1 long taper bushings. If you need a pair of bushings that are different than our standard packages, you can customize which bushings are included in your package by typing which bushings you want into the 'Bushing Selection' text box above. Example: 1 Long Taper and 1 Short Taper, 1 Short Taper and 1 Barrel, 2 short tapers, etc. Available in Black, Charcoal, Blue, Red and Orange.